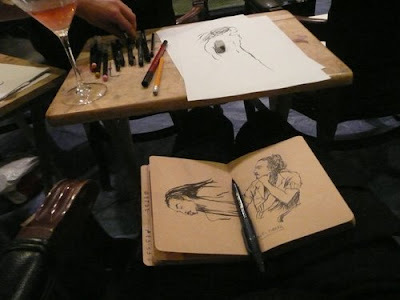 Every Tuesday and Thursday at the Society of Illustrators in New York you can sketch for three hours with a live band, drinks, and space to just draw. On Thursday, we did just that. 'We' was me and my friend from home, Tracy, a second-year student on Leicester De Montfort's fine art degree. 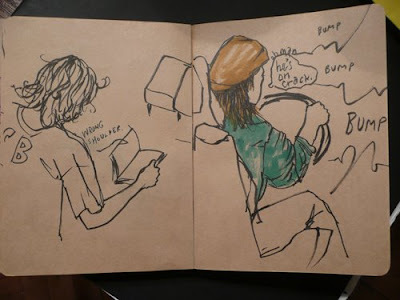 Armed with little more than a handful of Japanese calligraphy pens, one bluntish pencil and a tiny brown sketchbook, we went on the understanding that we could, as the flyer says, buy some materials on arrival. Erm...nope, no materials for sale, so having not wished to lug an A3 sketchbook, 78 Faber Castells and 50 Staedtler Tripluses to up 63rd St., this was an impromptu chance to 'improvise'. So there sat two giggling English girls, slightly louder than the rest of the (largely male) sketchers, swallowing gulps of 'inspirational' pink liquid to the sound of live jazz played by fellow SOI members. This got looser as time wore on...when we got to Maple Leaf rag, I was really loosened up. Creatively speaking. (Look - I don't normally drink, OK?) Very quickly I saw that Tracy was all about fast and furious, grabbing the line, capturing the pose. I was straight into detail - face, hair, eyes, clothing - and she worked big, I went in small. The painter and the illustrator. The impressionist and the narrator. The night was a fabulous three hour process of remembering what it is to draw with no agenda other than to try to record what you can see. It wasn't long before I remembered my drawing classes of yesteryear, and my habit of ignoring the slightly passe poses of the life model (we had two here, a semi-naked female and an often-starkers male) and focusing instead on the faces of the sketchers. The concentration...oh, the concentration. 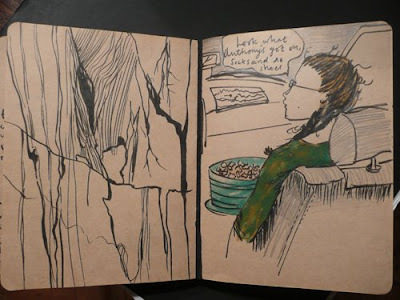 Following on so quickly from Barron Storey's sketchbooks, I felt old processes awakening and recently-acquired hang-ups disappearing. 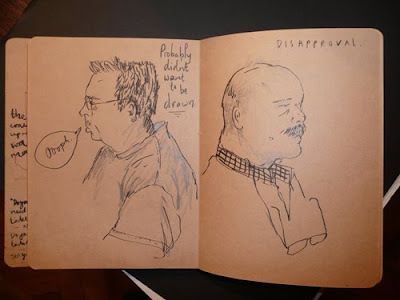 I took my sketchbook and a handful of tools to Providence that weekend and drew some more. In the car, on the rocks, in a cafe. I want to do it right now and only tiredness prevents. Someone famous I can't remember once said 'try to draw something every day, even if it's only something little', and I would really, really, like to practice that. Here, for better or for worse, is a selection of images from the night and a couple from the next day.